Dressed in baggy brown camo pants and a black hoodie, shoulder-length hair spilling out from under his baseball cap, Tony Sebastian, 27, looks like he’s just stepped out of a Snoop Dogg video, an impression that is only reinforced by the lit spliff in his right hand. It’s an overcast July afternoon, and we’re hanging out on the rooftop of a five-storey building in Matunga Labour Camp, just a few hundred yards from the outer fringe of Dharavi, Asia’s second largest slum, in Mumbai. In the far corner, a group of 18-20-year-old boys dressed in 1990s hip hop attire stand in a circle, listening attentively as one of their number spits out a verse he’d written the day before. In the background, a devotional song blares out from a temple loudspeaker, competing with azaan from a nearby mosque. “Yeh freestyle azaan hai,” jokes Sebastian, who also goes by Stony Psyko, and forms one third of the Dharavi-based rap crew Dopeadelicz. 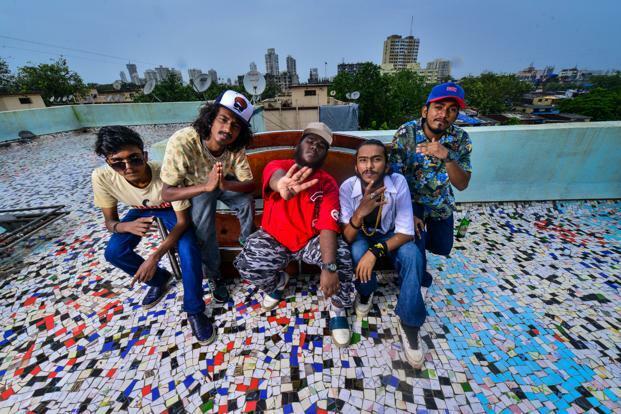 2018 has been a marquee year for the boys who, along with hip hop collective Slumgods and independent rappers like Rapture, are at the vanguard of Dharavi’s burgeoning hip hop scene. Just a few months ago, they were hanging out with actor Ranveer Singh and Zoya Akhtar on the sets of Gully BoyAkhtar’s forthcoming film based on the lives of Mumbai rappers Divine and Naezy, a project which some of them are involved in. With barely restrained excitement, they tell me about hotboxing in their vanity van and laugh about the bewilderment of the other junior artists on the set, who couldn’t figure out why “Ranveer bhai” was spending so much time with this ragtag band of stoners. In the middle of a tale about Singh’s attempts at freestyle rap, I catch Sebastian grinning like a proud elder brother as he casts his eyes over the group. I first met Sebastian in the autumn of 2015, when film-maker Sachin Pillai and I spent three days shooting Dharavi Hustle, a 10-minute documentary on the infamous Mumbai locality’s emergent hip hop scene. That summer, Divine and Naezy, hailing from Kurla East and JB Nagar, respectively, had released Mere Gully Mein, an Urdu and Mumbaiyya slang-inflected celebration of working-class life in the city’s gullies. It racked up millions of views on YouTube and put the spotlight on the city’s underground rap scene. Intrigued, I was looking to dig further into Mumbai hip hop when a music writer friend suggested I check out what was brewing in Dharavi. Tucked away in the slum’s narrow by-lanes, we discovered a thriving community of rappers, beatboxers, b-boys, and even a masked graffiti artist, going by the name Ganjaman, who took special pleasure in tagging (the act of writing your graffiti name) his pseudonym all over the area’s police chowkis. Led by Dopeadelicz and Slumgods, these young boys and girls—many of them still in high school—had taken the decades-old hip hop counterculture, forged in the racially and politically charged crucible of New York’s South Bronx in the 1970s, and made it their own. What their music lacked in sophistication and production polish, it more than made up for in its raw, perspicacious depiction of the realities of working-class life in the country’s biggest metropolis. Articulate and full of self-confidence, they spoke of hip hop not as a form of entertainment but as a vehicle for social and political change. And unlike rap scenes in cities like Delhi, Chennai or Chandigarh, the Dharavi hip hop movement was taking place right on the streets and laying down deep roots in the community. You couldn’t walk down 90 Feet Road—Dharavi’s main thoroughfare—without seeing pre-teens throwing crew signs, or stumbling upon a hip hop mural.